Now, Einstein is a new featherweight body for your daily use. Great features have been recapitulated from the previous Einstein intraoral camera series, but with smarter design. Einstein lumica maintains the superb ease of use with the fingertip operation and also provides more advanced features to your practice. The convenience and readiness of wireless connection simply add more values to the camera and effectiveness to your practice. 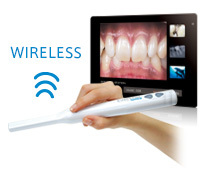 Wireless intraoral camera can always provide a quick and efficient "Informed Consent" whenever you want. No more wasting your precious time setting up the camera every time you switch rooms. It is always difficult to maneuver the conventional intraoral cameras due to the cumbersome hard-wire (connection). By comparison, because of the WIRELESS capability, our intraoral camera enables you to take close-up shots from various angles as well as positioning the camera to take tooth in a row. Moreover, the fully enhanced auto-focus function makes image capturing much simpler than ever before.